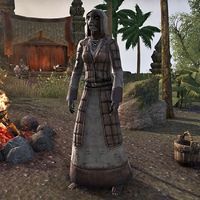 Badali is a Khajiit priest who is found near the Temple of the Crescent Moons on Khenarthi's Roost. She sometimes throws moon sugar into a nearby fire, which seems to greatly annoy her fellow priest Mikarur. She does not have any unique dialogue. This page was last modified on 7 December 2017, at 00:35.